Discussion in 'iWork Forum' started by davidalan99, Aug 2, 2011. In coming over from the excel / office side of the world I find myself in need of two good books to curl up to. Can anyone recommend a good book on numbers, covering it on the mac and on the iPad, as well as a good book on all of iWork? From basic to advanced. If it needs to be more than Atwood books then so be it. One to start and one for advanced work would be fine. In the past I have found the Que books to be of great help with all office products. Yes I have and from several of your previous posts. I have the sites bookmarked and sitting next to the app icon on my home screen, thank you very much. I would like to get some books with more detail than the apple site. Well, don't get iPad iWork by Minute Help Guides. I wouldn't call it completely useless, but there is actually more useful information (and easier to find) than in the online help pages. If you find a good book, please post back. I'm kind of interested. I'm not using anything professionally, so I'm willing to stumble though things on my own most of the time, but if I knew for sure of an excellent resource I'd be mighty tempted. A Numbers question concerning modifying charts - not to hijack this thread but a 'good' manual or online help would likely have been of use (unless my question has no solution in this program). I've been using Pages & Keynote, but just downloaded Numbers last night - and for my first 'simple' spreadsheet, I entered my BP (i.e. blood pressure) values - take these at home and my doctors like to see the values when I need to see them. 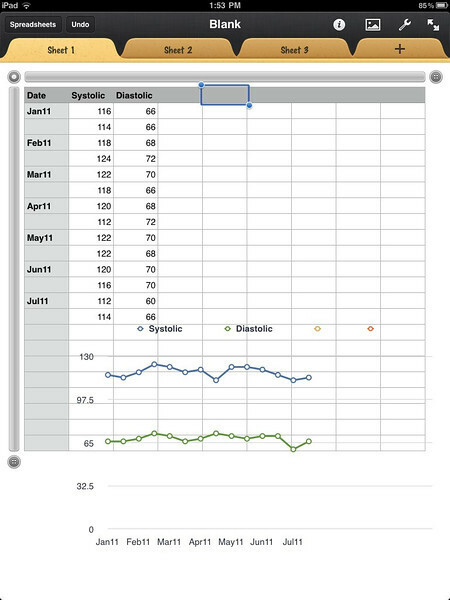 Below is what I generated for the first 6 months of 2011 - then brought up a chart and was able to get the data and the x-axis values w/o a problem; now I want to change the y-axis values to different numbers - I cannot figure out how this is done - must be either simple or not doable? Any suggestions from those who know this program better than myself? Tap the chart once to select it. Tap the the usual 'i' icon to get your options. Tap 'Y Axis', then 'Value Scale Settings.' You should be able to get what you want by playing with these. No problem. It can be tricky getting things exactly the way you want, but if you are like me tweaking is half the fun.